This Item is a Pre-Order and will arrive on: Wednesday June 28th 2017 ! MAR173195 - From New Vision Toys. From the action role-playing game Nights of Azure comes a beautiful figure of the main protagonist, Arnas! The part-human, part-monster holy knight swings into action, wielding her giant demon blade that has been recreated in striking red and blue colors! Her outfit is also incredibly detailed, down to the ripped hems of her skirt cape. 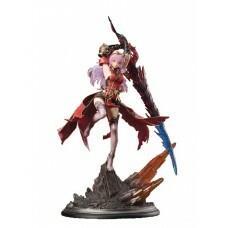 This impressive figure stands about 13 1/2' tall including her base. Be sure to add her to your collection!